A story about how we came to be Long Valley Timber, LLC. As a young boy around the age of 10, Wyatt Williams grew to really like chainsaws and cutting firewood to sell to the people in his hometown of Huntsville, Arkansas . There the excitement of watching as trees crashed to ground mesmerized young Wyatt. By the age of 14 he had saved enough money to buy his very own chainsaw. With this chainsaw, he then began cutting and selling even more firewood as his love for logging grew. Wyatt comes from a long line of outdoor, woodworking men. His great, great grandfather, Squire Williams, helped hew logs for the first ever courthouse that was built in Washington county . You could easily say that logging was in Wyatt’s blood! Wyatt remembers watching, as the young age of 6 years old, as logging crews using mules and old winch trucks to load logs onto their trucks and haul those logs to the mill. This process was very fascinating to him . Wyatt noticed, that the loggers would only cut the bigger tie log size, or the bigger trees, when working on a particular plot of land. They were in essence select cutting the plots. A few years later, an individual would not be able to determine that logging had ever taken place on the plot. Wyatt had never dreamed that one day his passion would be logging. Starting out on with his own logging business was the hardest adventure Wyatt had ever undertaken. It’s extremely hard, physical work and in some cases can be very dangerous. When working in the logging industry, one can come to believe that everything is always fighting against you. Whether that is the weather, daily, if not hourly mechanical breakdowns, continually rising insurance premiums, and ever fluctuating fuel prices . With any small business, good employees are also very hard to come by. Most individuals don’t want to go through the grueling physical work day in and day out that is required to be a logger. Those rare few are very special indeed. Long Valley Timber’s mission and goal each day is to strive to do exactly what the property owner requests. Our main focus is taking care of the property owner’s land first and foremost and making sure we compensate them for the logs which we harvest from their land. As a small business, Long Valley Timber doesn’t do much marketing, and most all of their work comes via word of mouth from their previous clients. Referrals are the life line of most small businesses and Long Valley Timber is no different. 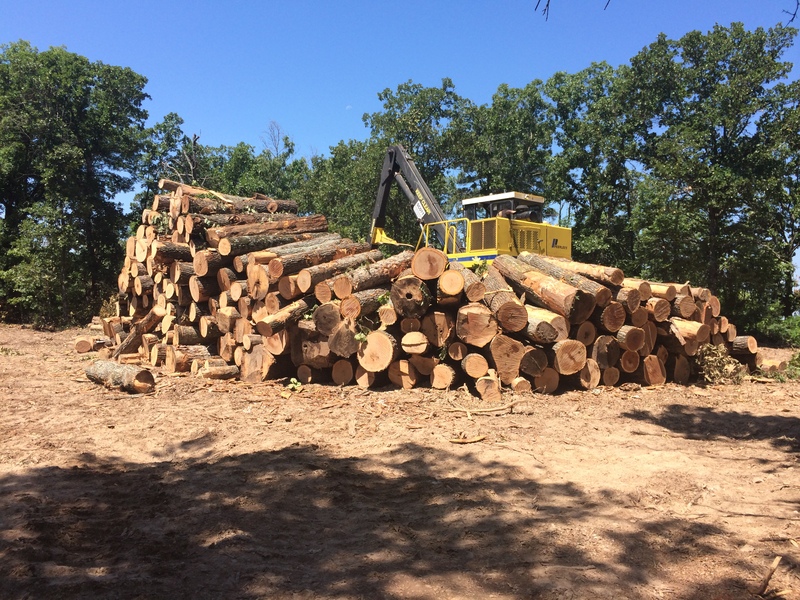 Long Valley Timber will haul the client’s harvested timber to the logging mill which will provide the best log scales and the best overall return for the timber. In March of 2006, the Arkansas Democrat Gazette did a feature story on Long Valley Timber, LLC titled “Money Grows on Trees”.